Procure a toothed metal rail or rack, A, such as is used for small ladder tracks, and mount it on the lower the Rack on the Lower Guide Rail Provides a Means To Keep the Vise Jaws Parallel edge of the guide rail for the lower end of the vise jaw. Provide a slot, B, in the leg of the bench, through which the rail can run with plenty of play room. A beveled plate, C, is attached to the face of the bench leg at the bottom of the slot, so that it will engage the teeth of the rack. 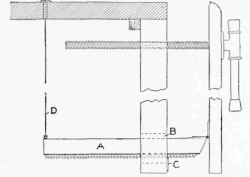 In use, when opening the vise by means of the screw, the rack will drag along the plate, and stop and engage a notch when the opening operation ceases. When it is desired to reduce the opening, it is only necessary to lift the rail by means of the string D. A button is tied to the upper end of the string on top of the bench, to keep it handv for changing the jaw. - Contributed by Harry F. Lowe, Washington, District of Columbia.